Some whales are big, some are fast, some have unusual looks. The fin whale somehow manages all three. Nicknamed ‘the greyhounds of the sea’, fin whales are the second biggest mammals in the world. 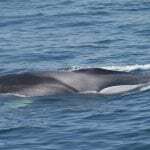 What do fin whales look like? Truly handsome individuals, fin whales have long, slender bodies that can grow up to a whopping 80 feet in length. With a distinct ridge running behind the dorsal fin, in some countries they have earned themselves the nickname “razorbacks” and cut through the water with ease. Like other baleen whales, fin whales have expandable pleats that allow them to take in huge amounts of water and food. They then sieve the water out through their baleen plates before ingesting their delicious meal, consuming up to 2,000kg of krill in a day. 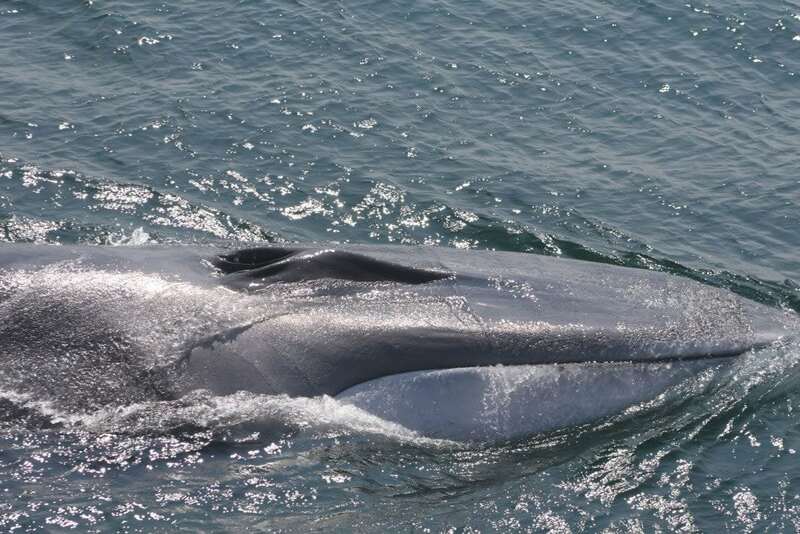 Mostly sporting grey, dark brown and black tones with a gorgeous pale belly, from a distance there might not seem anything unusual about fin whales. However, on closer inspection they have one very striking feature. Whilst on their left side their lower jaw is black, on the right side it is a brilliant white. The difference in colouration between each side of the body is called “asymmetrical pigmentation” and is only found in one other whale species, Omura’s whale. Some scientists believe this unusual characteristic may have something to do with hunting strategies, although nothing is certain. What’s life like for a fin whale? Generally found alone or in pairs, fin whales are mostly solitary and are rarely found in groups. Babies stay with their mums for around one year and learn all about the dos and don’ts in this time. Unlike other whales, fin whales are not too fond of the spotlight. They only rarely breach or spyhop, even avoiding raising their fluke out of the water for much of the time. Despite their seeming shyness, fin whales have no qualms when it comes to mixing with some other species of whales and have even been known to breed with blue whales, giving birth to hybrid calves! 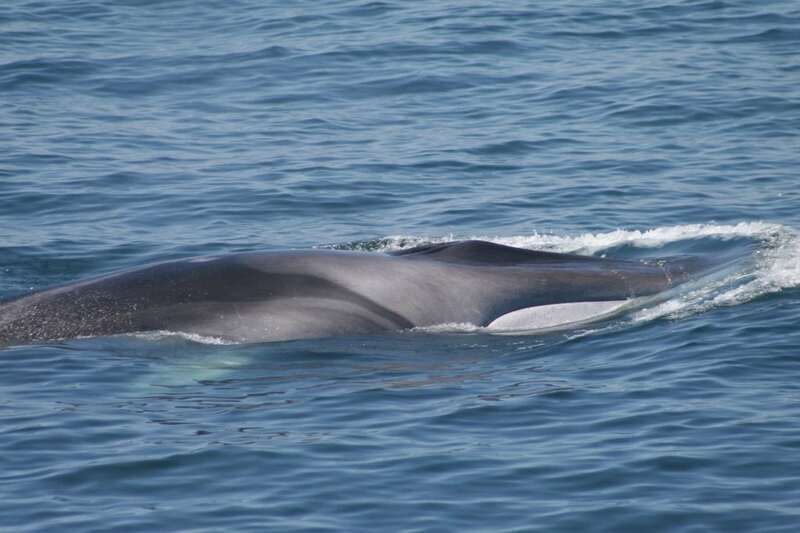 On the whole, life for fin whales has been particularly hard. Relentlessly hunted for their oil, meat and baleen, their numbers have been radically reduced by whalers, though in the earlier days of whaling they were often too fast to be caught by the whale boats. These days, the struggle is ongoing, and the dangers of whaling industries are a constant threat. Despite recognising their vulnerable status, some whalers in continue to target fin whales. What do fin whales eat? Fin whales have a pretty simple diet, consisting of krill, small fish and crustaceans. However, when you are that big and your prey is that small, you have to eat a lot to survive. In order to get their fill, fin whales can spend several hours each day feeding, gulping up to 70 cubic metres of water in one go before it sieving out. 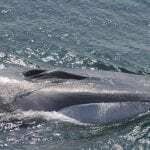 With such big tummies to fill, fin whales can consume up to 2000kg of krill every day. 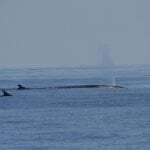 Where do fin whales live? Fin whales can be found all over the world’s oceans. Most at home in the deep, open ocean, they prefer cooler waters and are rarely found in tropical waters. Like other large whales, fin whales are thought to migrate between feeding and breeding grounds. 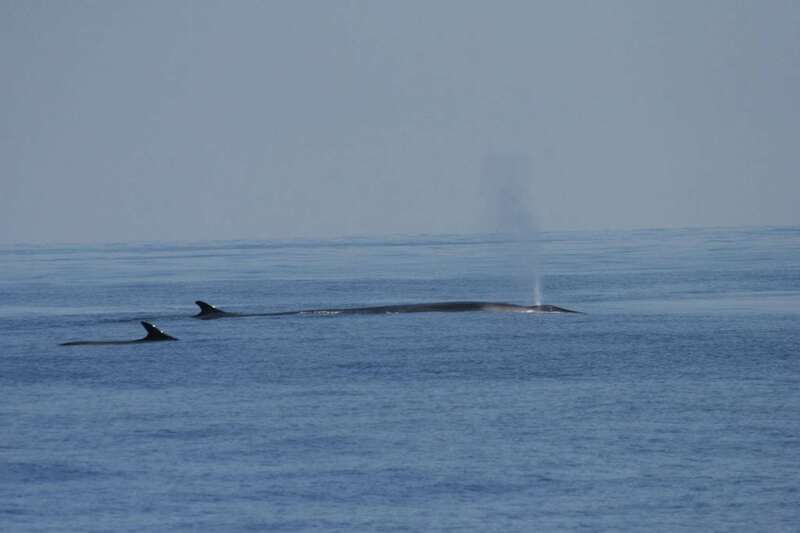 That said, resident populations do exist, and both the Gulf of California in Mexico and the Mediterranean are home to resident populations of fin whales. Fin whales can live for a really long time. One whale that was killed in Antarctica was discovered to be around 111 years old. You may think that something as big as a fin whale would be a little ungainly in the water, but think again. The fin whale is an extremely impressive mover and zips through the ocean with ease. Boasting a streamlined body and powerful tail, the “greyhounds of the sea” can reach incredible speeds of up to 45kph, nearly 30mph. Whilst the majority of people recognise fin whales’ vulnerable status, it unfortunately only takes a small number of people to drastically impact their already fragile populations. In such a vulnerable situation, fin whales need all of our help to ensure their survival. Sadly, in Iceland a small group of whalers, backed by government and industry supporters, continue to see fin whales as a lucrative commodity. Please continue to support the WDC to raise awareness of fin whales’ plight and put an end to whaling for good. Fin whales are endangered yet some people still want to hunt them while other human activities also pose a threat. Whaling – Iceland still hunts and kill fin whales. Ship strikes – fin whales are sometimes hit by fast-moving vessels resulting in injury or death.